Tonight I wanted to make something different with the frozen chicken thighs I had in the freezer. I remembered I hadn't used any of the Saffron I bought in New Jersey, in quite a while. I therefore hoped I had the ingredients to Paella. I made a few changes to the recipe because I wanted to use what I had at home and not go to the store for any extra ingredients (if I could help it). - When the recipe calls for "bowl" I believe it refers to "cup" measurement. - I found that frozen peas work better in this dish and they should be added at the last minute. - Chicken broth works well in this dish and can be easily subsituted for meat broth (which I take to mean beef broth). - I skipped the green and red peppers altogether because I simply did not have any. I used a little more garlic and onions instead. 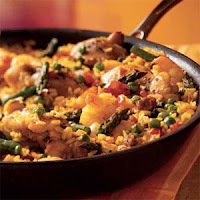 - The recipe forgets to mention when the uncooked rice should be added. (BTW, I used 1 1/2 cups of rice instead of 2 cups and 3 cups of water), After I added the tomatoes (I used canned tomatoes), I added the rice. I think that is it. My family really enjoyed this meal.